Product is made of cane and decorated by colorful velvet & artificial flowers. It can be used for trousseau packing for gifting in weddings. 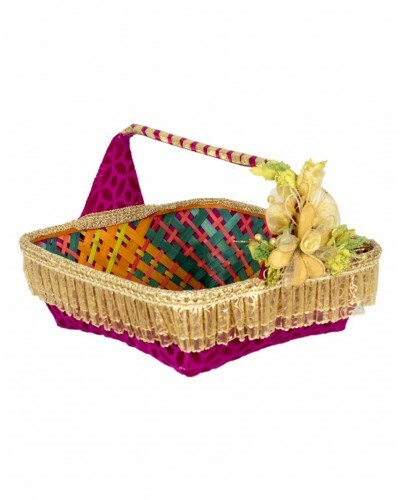 This decorative basket is made out of cane and is decorated using velvet material. With golden colour tassles like arrangement on top and beautiful flower pattern on the side, this basket is great for any occasions. It can be used during weddings as a fruit basket. It is also available in various colours such as red,green and dark pink color .